Like every good trunk’s handle, this one tells a story. It is the universal story of a little man running out from your trunk. What are you doing in my trunk, little man? Why are you popping out just when I’m trying to close the door? Damnit, little man, come back here with my wallet! I am impressed by this man’s spectacular leap from the trunk. If you’ve ever attempted to jump out of a trunk, you know that it’s hard to make it two or three feet, since there’s hardly any room to gather yourself. But this little man appears to have cleared a good six feet in one spectacular bound, landing in perfect running form. Needless to say, there’s no catching him now. In the end, nobody really knows why he was in the trunk, nor how he managed to hide in there for so long, but something tells me that the next time my friend goes grocery shopping, this enigmatic little man will be back to his old antics, forever making that celebrated escape from the trunk, forever inspiring countless grocery shoppers in one of the greatest stories in all of literature. 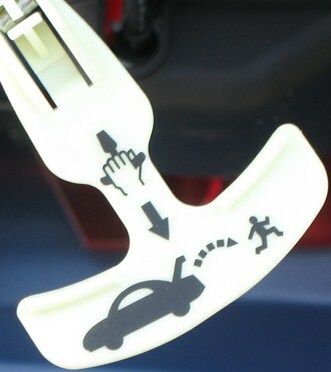 Note to self: Remove trunk handle instructions next time I abduct someone. You don’t know how many times my kidnapping plans have been foiled by this meddling sign.